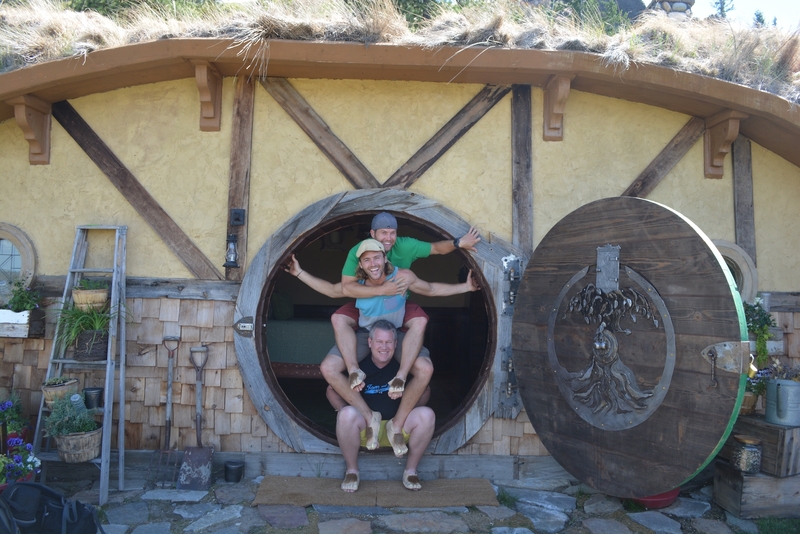 The Spud Studs… and Larry: The legend and lore behind their creation. 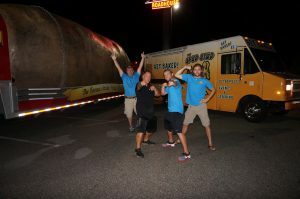 Over these past five tours, we’ve had various groups of three people traveling with the Big Idaho Potato Truck. Collectively, they have been known as ‘The Tater Team’. The name made sense as it fittingly encompassed the varying demographics and skillsets that each team was comprised of. The first year’s group was the O.G.s or The Pioneers: Paul, Kaiti and Ellis. The second year saw Fresh Meat & Potatoes: Paul, Kristie and Tyler. 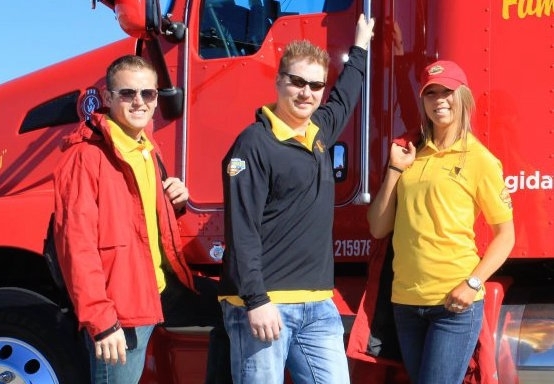 The third year was a combination of previous team members and our ‘local’ driver… They were dubbed the Dream Team: Larry, Kristie and Ellis. But year four was a completely different beast. We started the tour with our first female driver, Phyllis, before bringing Larry back out three months in. This change created a whole new dynamic… an all male cast. Now while this was never the intent, it certainly provided for some new opportunities… and certainly, a new name was in order. Enter, THE SPUD STUDS. So let’s talk a little bit about how the Spud Studs came to be. 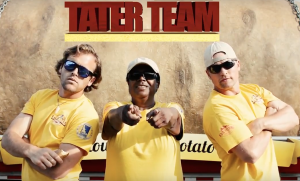 Why didn’t we just stick to ‘Tater Team’ like every other year? If the answer to that question isn’t obvious then, well, you just don’t ‘get’ us. We’re studs, plain and simple. 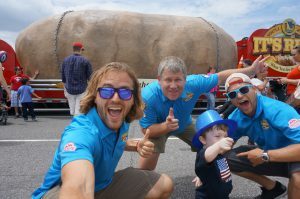 We also happen to travel with the world’s biggest spud. Enough said. Adam, the two-year veteran, was the first to make this connection and use ‘spud studs’ in conversation. As such, he was also able to get the jump on Ellis, a four-year veteran, on claiming the title as Spud Stud #1. But this was okay because, for Ellis, this title didn’t quite capture his essence anyways. He wasn’t simply the first… he was the original. The longest lasting. He is, an O.G. : an ‘original gangster’ in the world of the Spud Studs. So it only makes sense that he would be considered The O.G. Spud Stud. 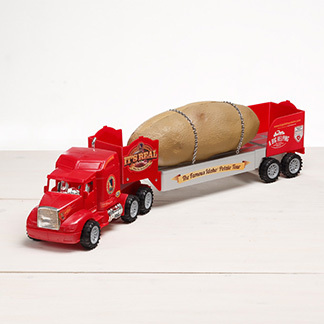 Now as for Larry, the driver, his status as a Spud Stud was suspect by many… By who you ask? And why? Great questions, and I have no idea. But it seems to just make sense. So much sense, that it was further justified by one visit to Valley View Elementary. This is a story within a story. A story of how and why Larry is not a Spud Stud, but, instead, more of an afterthought on the concept connected by a conjunction. You see, originally we had included him in the Holy Grail. He was one of us. 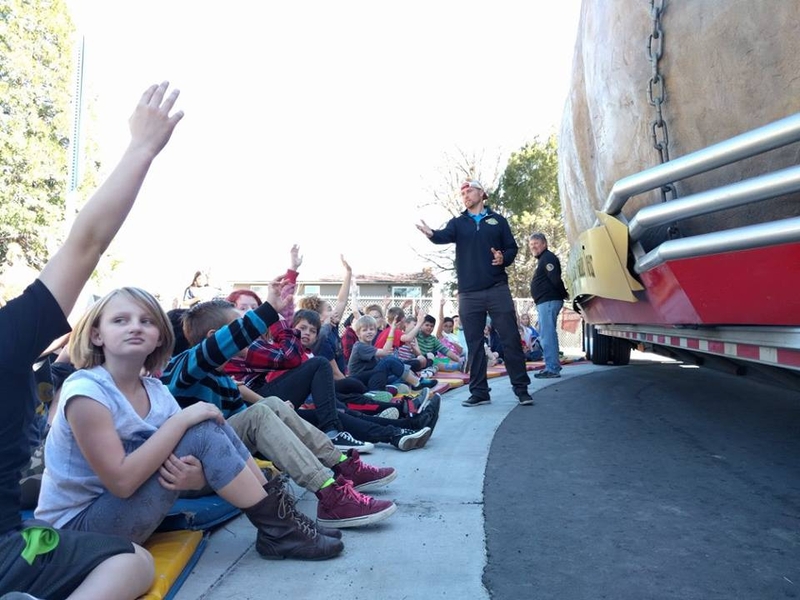 But one bright, sunny day early in 2016, we visited Valley View Elementary School. We showed up and put on our presentation like we always do: full of jokes, laughter, potato climbing, nutritional information, and fun facts. 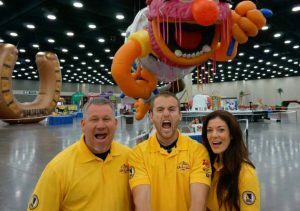 As always, we were a hit! We finished up by joining one of the classes for a baked potato bar in their room. We hit it off with the students and teachers and reluctantly left when they had to go back to learning other less important information. 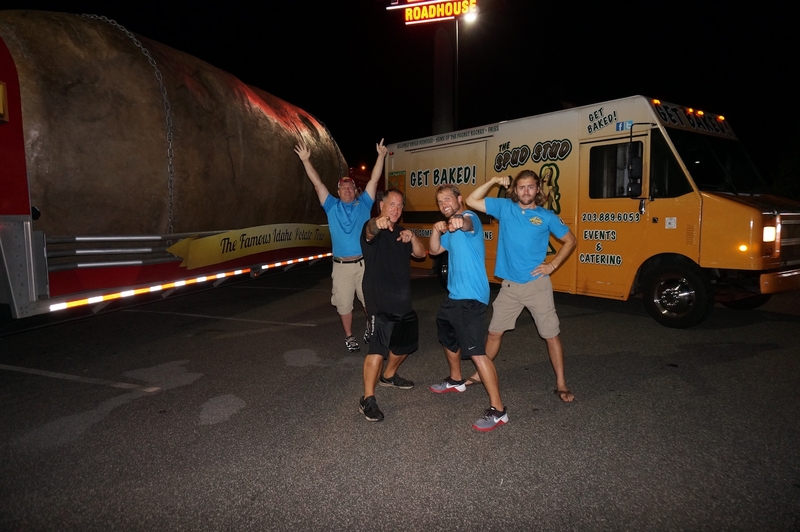 We left that day and soon were back on the road, traveling the country with the Big Idaho Potato… and then it came. We received a wonderful box, filled with postcards, water bottles and a $25 gift card to Subway. But that box contained more than just tangible items. The box brought an idea; a concept that would forever shape Larry’s future. 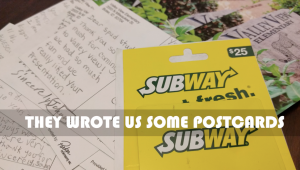 We voraciously read through the postcards. Each one had it’s own unique touch: some had a picture, some had a postscript and others had personalized comments. The two things that they all had in common, though, were love and appreciation. But as we continued reading we started to notice a pattern. Not one, not two, not even just three; but more than five of them had a similar theme. And that theme was in the intro: “Dear Spud Studs and Larry”. We couldn’t believe what we were reading. Through only a couple hours of interaction, the students demonstrated clairvoyance far beyond their years. Through no influence of our own, the students had answered a question that we had been asking ourselves all year. They put to rest the discomfort that had been at the back of our minds every time we had introduced ourselves as ‘The Spud Studs’. And they did it with all of the unfiltered and bias-less innocence that only a child can. They had settled it, once and for all, that Larry isn’t a Spud Stud, but something far superior… he is an ‘and Larry’. We looked at Larry hesitantly as the realization hit, unsure how he would take the information and this new responsibility. But sure enough, it was almost immediate how he owned up to his obligation as an ‘and Larry’ with all the courage he could muster. An amount of courage one could only obtain by being involved with the Big Idaho Potato since its inception. It is true that in this moment of transformation, Larry had reached Maslow’s pinnacle: self-actualization. We tell you this story today not to brag but, instead, to accomplish a few different goals. 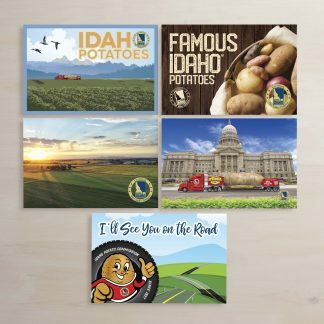 First, we aim to inspire the next generation of Idaho potato lovers. 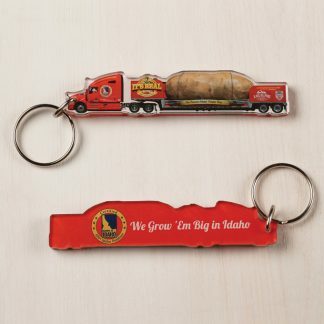 They need to understand that being a Spud Stud isn’t easy and that persistence and hard work will only get them so far. On top of both of those things, they will need to stay in school and eat their potatoes. Potatoes are the new spinach (as we like to say) so move over Popeye, the Spud Studs… and Larry are in town! 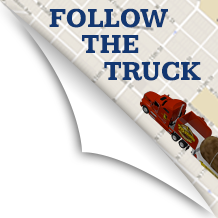 Secondly, this blog post serves as a backup to the oral history of how the Spud Studs… and Larry came to be. For generations, legends and lore were past down via word-of-mouth, which carried with it a whole slew of problems for obvious reasons. This aims to prevent our story from becoming diluted down below its current state of awesomeness. And third, it will hopefully help Google clean up its act! The other day I Googled ‘Spud Studs’ and not one of the first page results mentioned us. What kind of mashed up potato is that? Seriously. 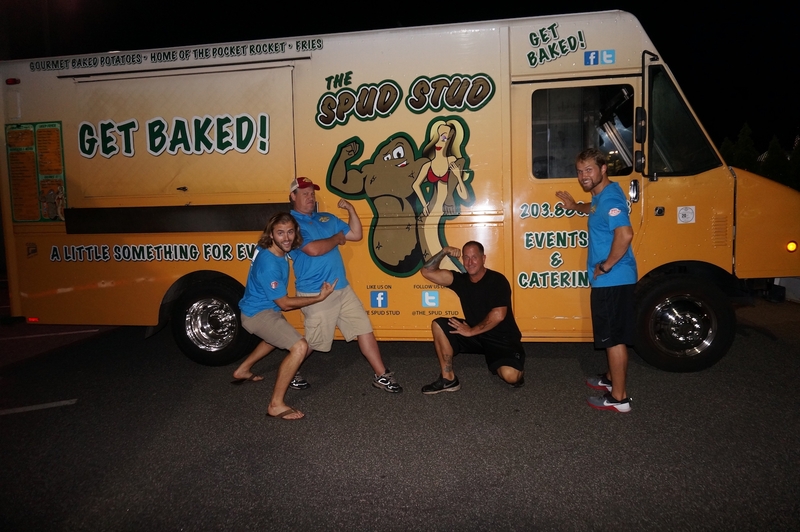 The search results were muddled with links to food trucks, weird videos and potato baking nails (on a side note, we ended up meeting up with The Spud Stud food truck the following week in Connecticut, and the dude and his wife were pretty cool… the potato baking nails, on the other hand, are a ‘half-baked’ gimmick). This is unacceptable and we hope that with this blog post, a little karma, and Google’s appreciation for good SEO… this unfortunate circumstance just might be reconciled. 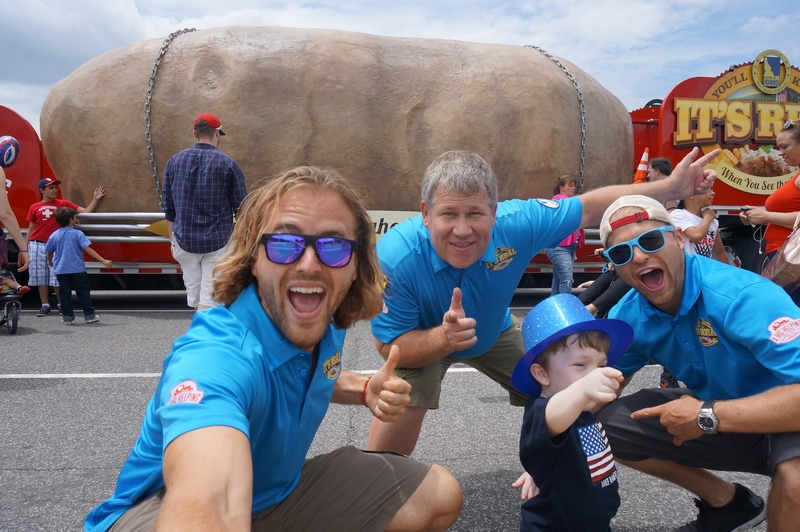 Of course you can help by calling, messaging and yelling… about who the true Spud Studs (and Larry) really are.